I have fulfilled a lifelong goal. I have been awarded food as a prize for running at a modestly quick pace in a race. 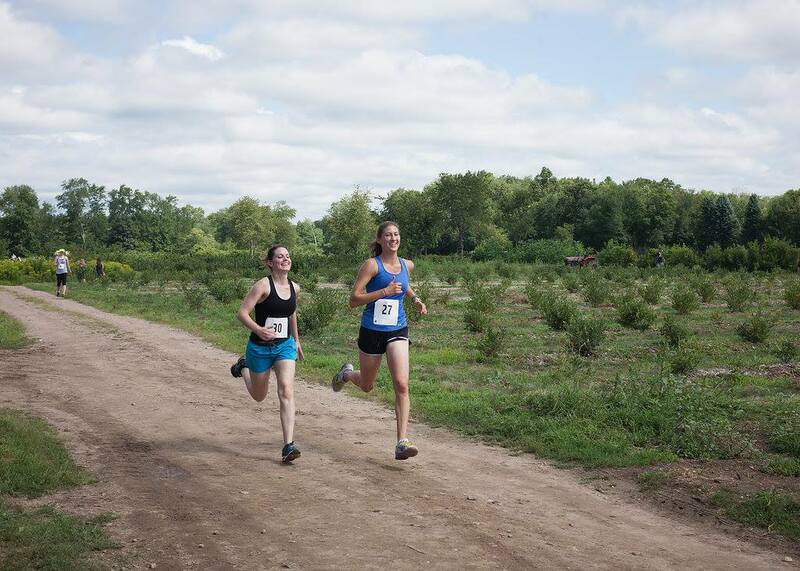 The dream was realized at Red Fire Farm in Granby, MA on Sunday, August 23rd during their annual "Tomato Trot 5K" cross country race through the farm fields. Chris and I are CSA (Community Supported Agriculture) members at Red Fire Farm. In case you're not familiar with the concept of CSA, a brief explanation: It's a partnership between families and farmers. We invest a small sum to "buy into" the farm at the beginning of the growing season in exchange for a weekly share of the farm's harvest. Every Thursday, Red Fire delivers a whole bunch of produce to Union Square and we stop by to pick up our share of vegetables. We really enjoy supporting this wonderful organic farm and the bounty of vegetables we receive each week is, often times, overwhelming. We don't always know exactly what we're going to get. The contents of the share depend on how things are growing in a particular season and what the farmers were able to harvest. There's a ton of variety week to week. I've learned to cook vegetables I had never heard of before joining a CSA. I still haven't figured out an appetizing preparation for kohlrabi, though. If any of you have suggestions, I'm all ears! Each year near the end of August, Red Fire Farm hosts a Tomato Festival. The day-long event includes tasting 100+ varieties of heirloom, cherry, slicing and saucing tomatoes, cooking demonstrations and workshops, local food trucks, craft vendors, musical performances, and THE TOMATO TROT, a spirited 5K-ish race through the farm fields. 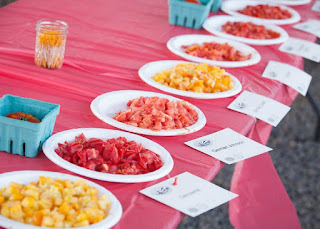 From start to finish, the 14th annual Tomato Festival was an incredible community event. We arrived early at the farm, parked nearby, confirmed our registration and retrieved race bibs from a small tent in front of the farm, then followed the arrows on a hand drawn map to the starting line "up the street a ways". At first, it was difficult to identify where the race would start. 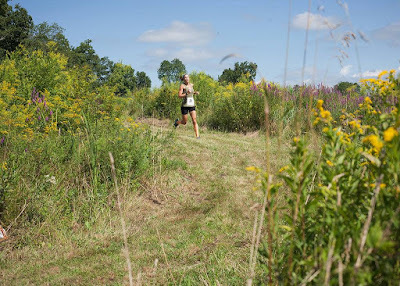 A few runners trotted up and down the hill to warm up and stretch out, and others milled around a patch of hay we identified as the most likely start line. 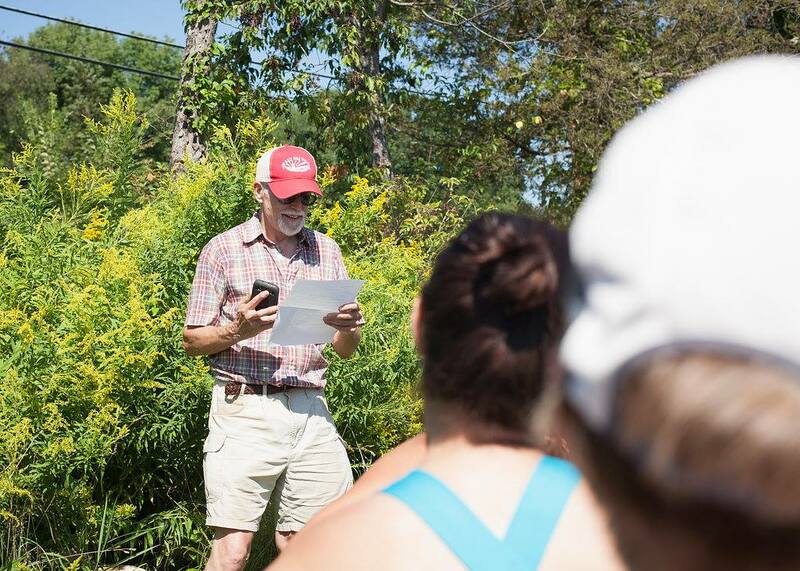 Eventually, the two race coordinators, who introduced themselves by stating, "Our only distinction is that we are the fathers of the farmers," ran through the logistics while the small group of us crowded around. Because there had been heavy rain the previous day, these men had stayed up late into the night to make sure the paths were cleared and well marked with spray-painted arrows. And we were off. Here's Becca, most cheerful runner in all the land! The first half mile of the course required cautious steps. Red spray paint marked a number of hazardous small dips and divots in the terrain. We turned a corner, and as I grew more comfortable with my footing, I was able to lift my gaze to take in the beauty of the farm. We ran through corn. We ran past flowers. We looped around melons. The mile markers weren't distinguished in any way, but the path was easy to follow and clearly marked with arrows. The field of runners was quite small (fewer than 160, I think,) and there were stretches of the course where, flanked on both sides with corn, I could see no one ahead of or behind me. I felt pleasantly alone with my feet and my breath in the fields. 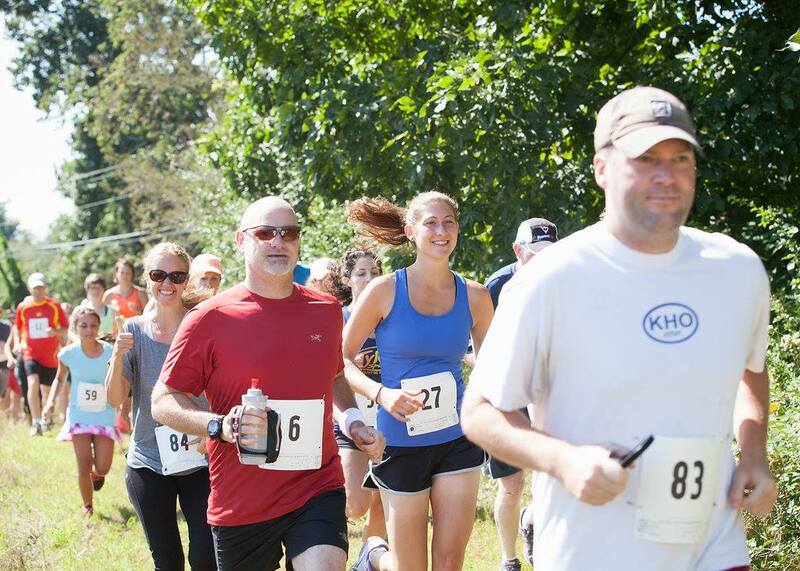 Shortly after what I estimated was the 2 mile mark, I spotted a photographer as I came around the corner. 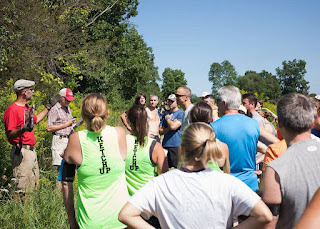 Runners briefly entered the street and looped around to the front entrance of the farm, where a small, but energetic crowd cheered us down the drive, around a field, past a patch of flowers, and through a tractor-lined finish chute. 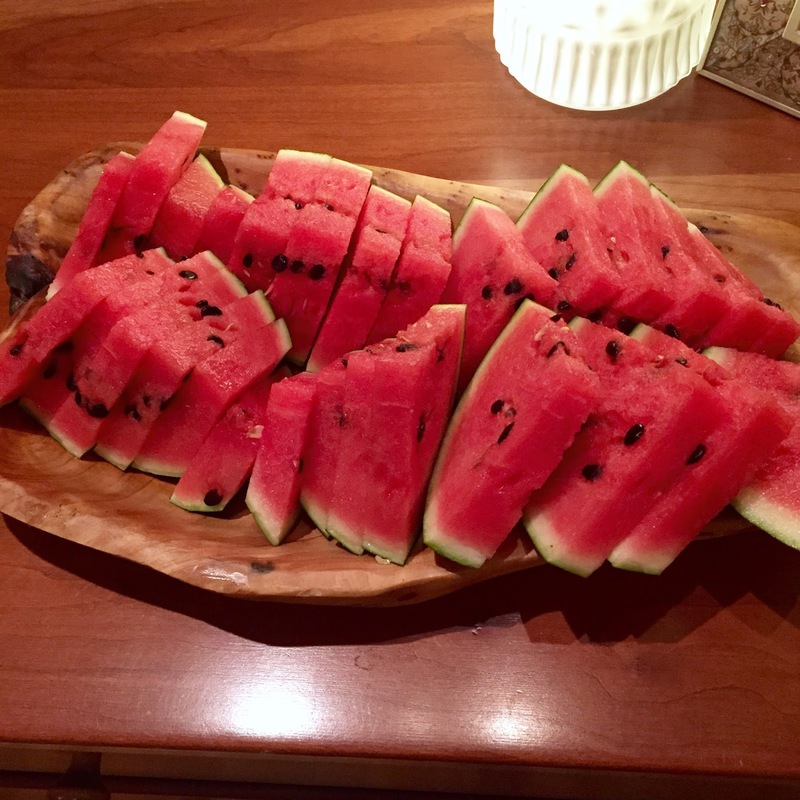 A table of watermelon slices awaited us at the finish line. There was a small clock near the finish line, but I didn't catch a glimpse of it and no official time was kept. 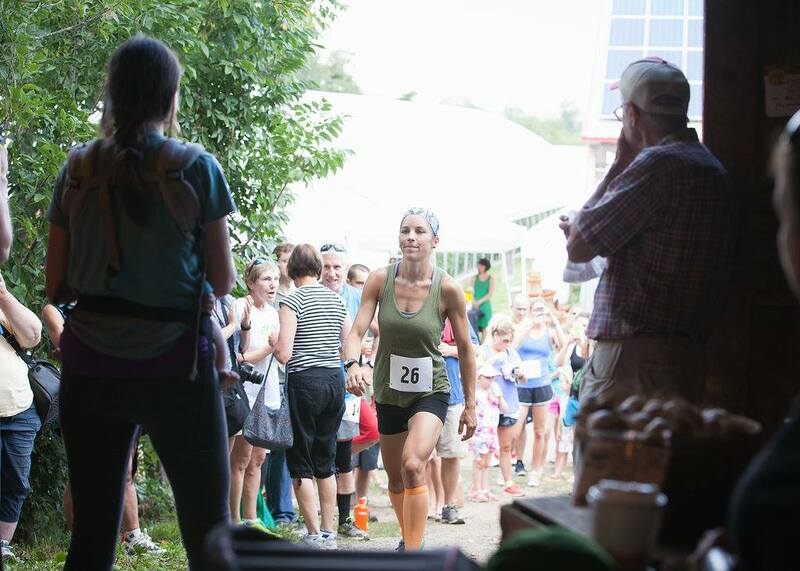 As I crossed the finish line, someone told me, "I think you're the third woman." I feel no shame in admitting that I love to run small races because there is a far greater likelihood of finishing near the front of the pack. No shame. I caught my breath and cheered in Ciara and Becca as they raced one another to a photo finish. It was a tie. We snapped a finish line flower photo together and I awaited the award ceremony wondering whether I really had come in third place. I grinned as I was awarded a melon and a farm market gift card. We stuffed our faces with wood-fired pizza, grilled corn, ice cream, and tomatoes. 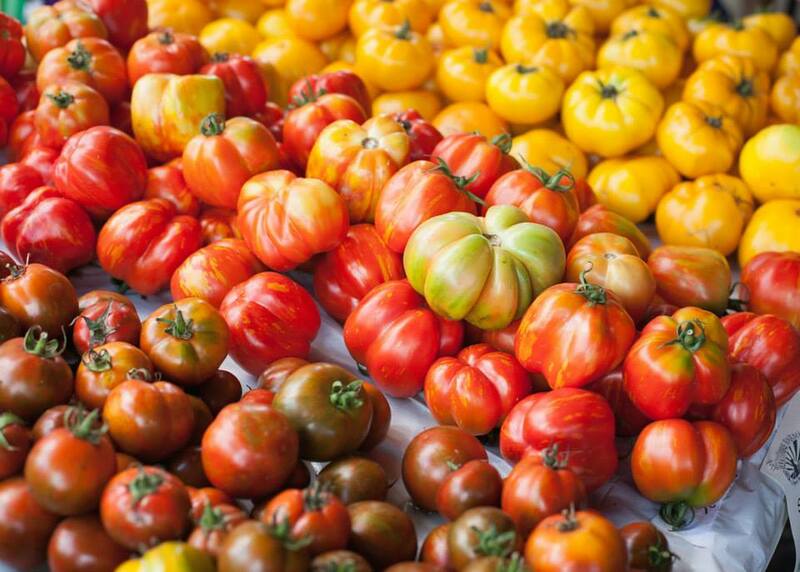 So many tomatoes! ...and spent the rest of the afternoon listening to music, exploring the farm and enjoying the Vegetable Freak Show. I promptly made use of my winnings and brought home this excellent bounty! 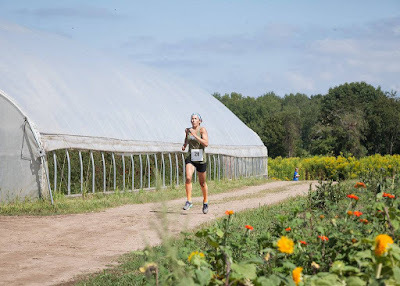 Thank you, Red Fire Farm, for putting on a fun and beautiful little race. I'll be back next year. For the record, the tiny watermelon tasted like late summer candy. Please don't end, summer! 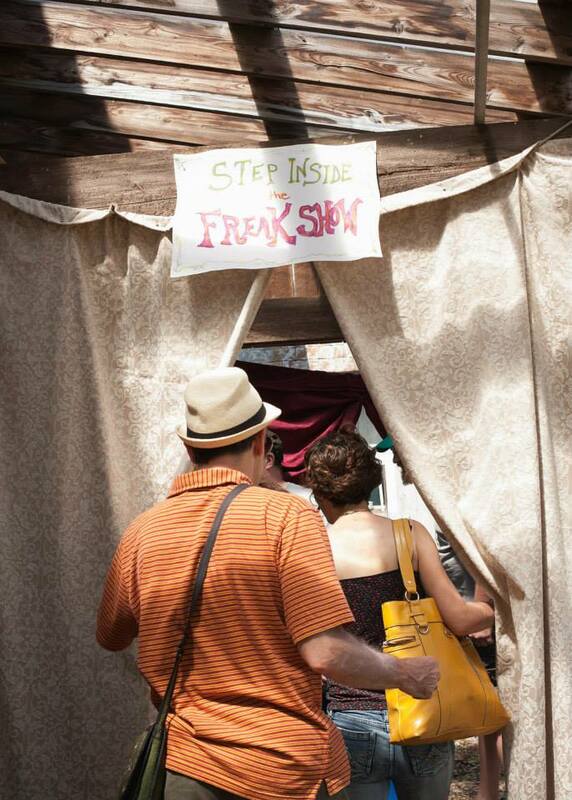 *DISCLAIMER: A handful of these photos are lifted from the Red Fire Farm Facebook page. I am grateful for them and hope they do not mind my theft!